This Easy Chili Recipe is filled with beans, tomatoes, corn and plenty of Mexican spices. I’ve made this with meat and without and it’s delicious both ways. 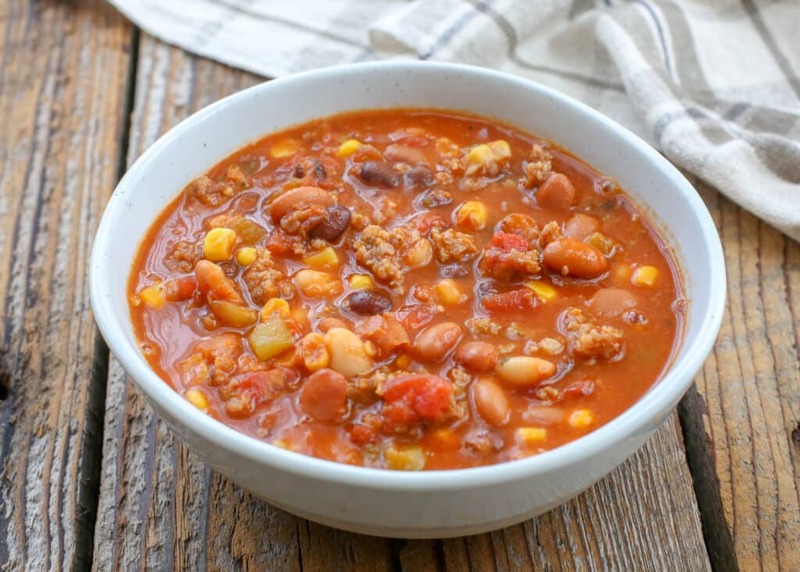 I’m sharing this simple nine can chili with you today, because it has become my go-to dinner plan when we are arriving home from traveling and I don’t have time or motivation to head for the store. Originally, this was simply an assortment of canned goods that I combined one afternoon when we had just arrived back in town and there wasn’t a bit of fresh food in the house. After every single person at the table commented on how much they enjoyed the meal, I decided to scribble out a list of the ingredients and make it again. I’ve tweaked the ingredients a little bit here and there but no matter what, it comes out delicious every time. The convenience of this recipe can’t be beaten. Nine cans, a handful of shredded cheese and (if you like) cooked meat and time make for a comforting, warm, satisfying and healthy meal. 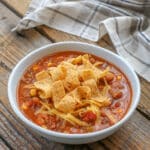 I’ve made many chilis in my day and many, like Hearty Pepper Chili, White Chicken Chili, and Italian Jack Chili, have become staples for family meals when we’re in the mood for something hearty. On those days when I know we want something meaty and spicy, I whip up a batch of Spicy Five Bean Chili with Steak and Sausage. This Basic Chili Recipe is a return to the basics of chili. Tender beans (and meat, if you choose) and green chiles stewed with fire roasted tomatoes and spices to create a spectacular marriage of flavors that can be served in so many ways. Chili and Cornbread is a classic American southwest pairing that will make you feel like a cowboy sitting around a campfire. 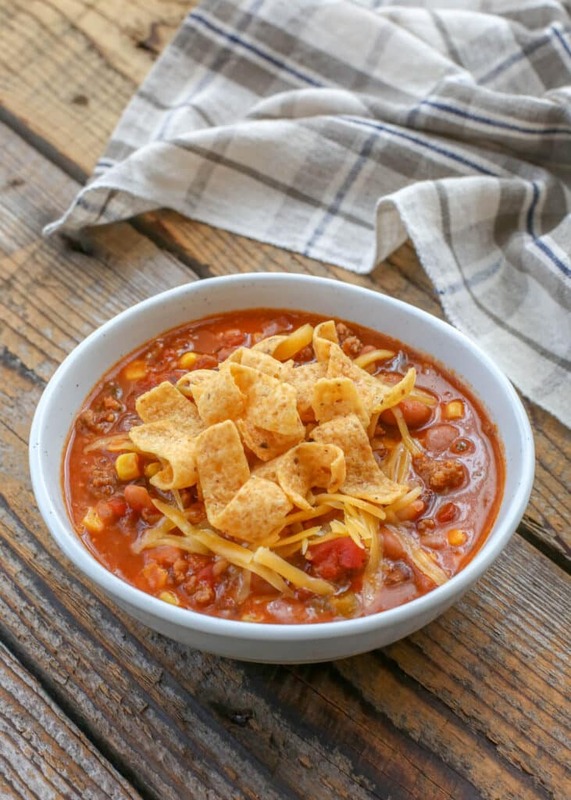 This chili would also be delicious served with sour cream, cheese, and salsa and scooped with tortilla chips or in Frito Pie. Slather it on hot dogs to make easy Chili Dogs, pour over a baked potato, use it in Chili Mac, or just eat as is. This is the one chili recipe you’ll want to make over and over again. 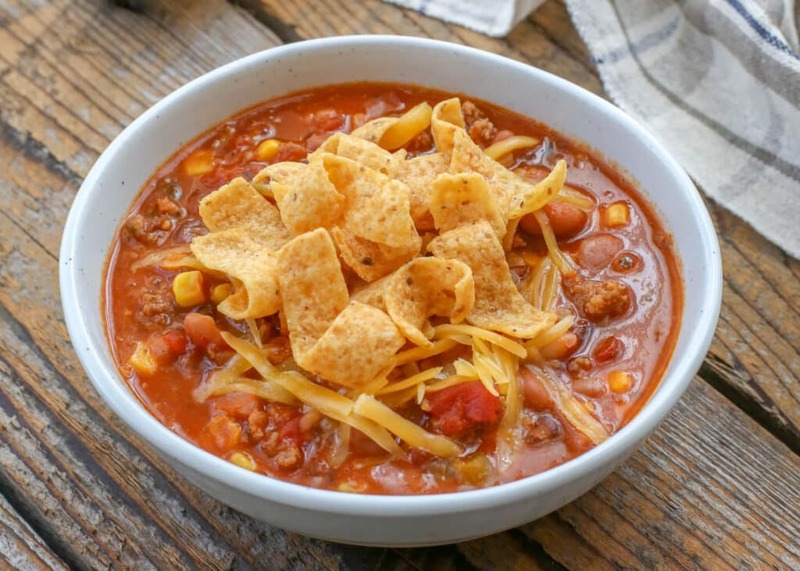 Because this basic chili recipe relies entirely on canned ingredients, it’s a fantastic option for when you’re low on groceries or without access to fresh produce. Tip: Put this chili on your meal plan for the end of the week when you might be low on fresh produce before your shopping day. Nothing about it tastes “canned” and it’s an economical, tasty way to use up pantry items. While you can just bring all the ingredients in the chili to a simmer and serve right away, this is a recipe that greatly benefits from time. The longer you simmer your chili, the better all the delicious spices and flavors can meld. I often cook this chili in the slow cooker. Toss everything in the Crock-Pot in the morning and your home will be filled with the enticing aroma of chili all day long. You’ll hardly be able to wait for dinner time! You can also “slow cook” this recipe on the stove top. Simmer for several hours (at least two but as many as 10) and you’ll be rewarded with an incredible dinner. Chili is also a great “next day” meal! The flavors will have even more time to mingle and come together in the fridge overnight making reheated leftover chili just as good for lunch the next day. 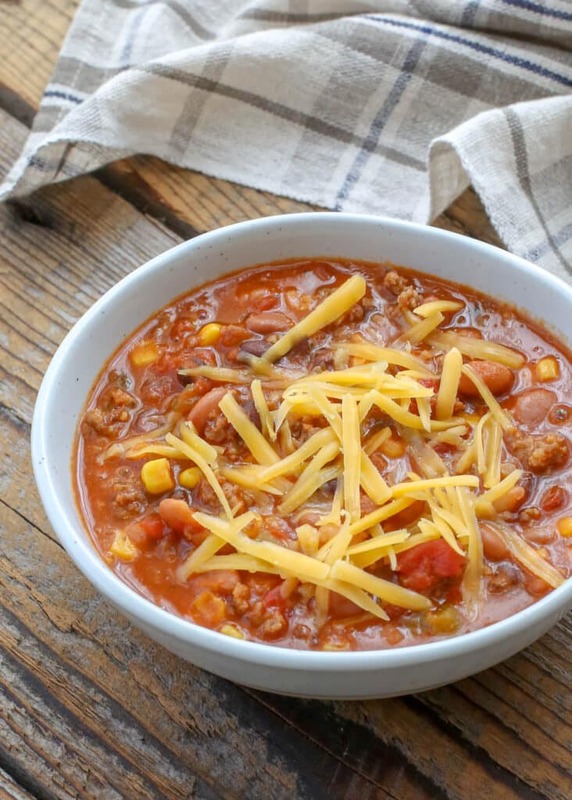 For more Crock-Pot friendly recipes, check out these 10 Slow Cooker Soups. I sometimes add meat to this chili but it’s still extremely tasty without. The beans are packed with protein that make this a stick-to-your-ribs vegetarian meal that satisfies even the most voracious meat lovers in my family! If you omit the cheese on top, it’s even vegan to boot. Looking for more vegetarian meal ideas? Vegetarian Four Bean and Chipotle Chili and Pasta E Fagioli are two other easy meat-free dishes I love that use canned beans. For more hearty chili recipe to try, check out our White Chicken Chili and Sean’s favorite Hearty Pepper Chili. This Homemade Hot Dog Chili is a great way to top a hot dog and it’s a sure win with the whole family. This chili recipe is hearty, warm, slightly spicy and peppered with plenty of hot green chile flavor. It uses ingredients you’re likely to already have in your pantry and is as easy as it gets when it comes to chili. It’s perfect for beginning cooks or for those looking for a nice and simple economical homemade meal without a ton of fuss or mess. STOVE-TOP DIRECTIONS: Combine all ingredients in a large pot or Dutch oven. Bring to a simmer over medium-low heat, cover with lid and simmer, stirring occasionally for 2-10 hours. (Yes, you can simply bring the chili to a boil, simmer 15 minutes and then serve it. However, if you have the chance to cook it longer, I highly recommend it. The flavors will change into something even better if you allow them to simmer together for a while.) Serve with the toppings of your choice. Enjoy! CROCK-POT DIRECTIONS: Combine all ingredients in a large crock-pot. Cook on LOW for 8-12 hours. Serve with the toppings of your choice. 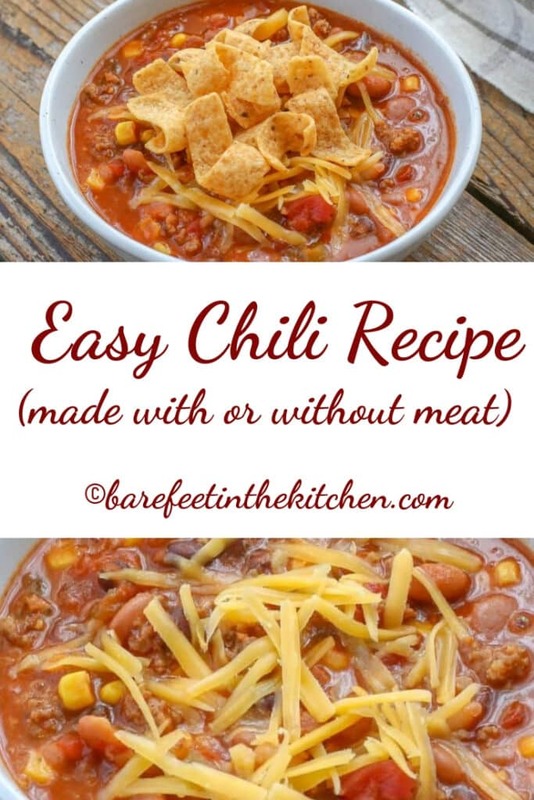 The convenience of this easy chili recipe can't be beaten. STOVE-TOP DIRECTIONS: Combine all ingredients in a large pot. Bring to a simmer over medium low heat, cover with lid and simmer, stirring occasionally for 2-10 hours. (Yes, you can simply bring the chili to a boil, simmer 15 minutes and then serve it. However, if you have the chance to cook it longer, I highly recommend it. The flavors will change into something even better if you allow them to simmer together for a while.) Serve with the toppings of your choice. Enjoy! CROCK-POT DIRECTIONS: Combine all ingredients in a large crock-pot. Cook on LOW for 8-12 hours. Serve with the toppings of your choice. Enjoy! I've made versions of this chili both with and without meat. For the batch of chili pictured, I used 1 pound of ground beef, cooked and crumbled, plus (4) Italian sausage links (this was about 1 pound) browned on each side in a medium heat skillet and then sliced into bite-size rounds. This sounds good to me. I love "open and dump" recipes. I like V-8 Hot and Spicy and wonder how that might be to add a little? Pinned it! The sauce looks so rich and flavorful. Another home-run Mary! Hope you are doing great. Thank you, this will be great to warm up to during our crazy March weather in Wisconsin. This sounds delicious. I’m trying it tonight! I do not drain the beans for this recipe. On this, you say meat of your choice. In your opinion, would this do well with chicken? Hmmm, I've never tried this with chicken, but I think it would work. I'd add the cooked chicken right at the end of the cooking process. Let me know how you like it! I can't find ranch style pinto beans...is there a substitute? You can typically find "chili beans" in most grocery stores and they will work nicely. Can you make this with ground turkey meat instead of ground beef? Sure you can, Rosa. Enjoy the chili! The recipe is at the bottom of this post, just above your comment.